This world famous fig tree is of the species Ficus virens, it is a strangler fig tree. Located about 1 kilometre out of Yungaburra, this ancient tree is awesome in its size and grandeur. Directions to this fantastic tree are well sign-posted and the short drive well worth it. Plenty of car parking available. It is a 50 metre walk to view the tree. There are interpretative signs which describe how the Curtain Fig Tree grew and some additional interesting information. There is a continuous board walk around the tree and a section which creates good perspective for photo opportunities. Lumholtz Tree Kangaroos & Green Possums can sometimes be seen asleep in this area during daylight. After dark you can spotlight for Tree Kangaroos, Green Possums, Herbert River Possums and Coppery Brushtail Possums. It is one of the largest trees in north Queensland, and one of the best known attractions on the Tablelands. 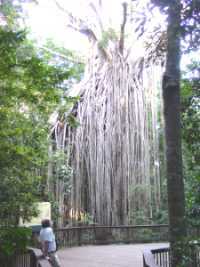 Its curtain of aerial roots drop 15 metres (49 feet) to the ground. Large basalt boulders cover the forest floor, which is probably why the forest here wasn't cleared for farming - and why the curtain fig tree remains standing.